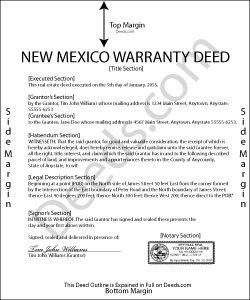 In New Mexico, real property can be transferred from one party to another by executing a warranty deed. Warranty deeds are statutory under NMSA 1978 Sections 47-1-29 and 47-1-44(1). The statutory form includes the words "with warranty covenants" (NMSA 1978 Section 47-1-44(1)). When the words "warranty covenants" are used in a conveyance, they carry implied covenants that the grantor holds title to the property; that the property is free from encumbrances (with the exception of any noted in the deed); that the grantor has "good right to sell and convey the same"; and that the grantor, "and his heirs, executors, administrators, and successors shall warrant and defend" the title against all lawful claims and demands (NMSA 1978 Section 47-1-37). So, statutory warranty deeds offer the highest level of protection to the grantee. As with any conveyance of realty, a warranty deed requires a complete legal description of the parcel. Recite the prior deed reference to maintain a clear chain of title, and detail any restrictions associated with the property. Finally, it must meet all state and local standards for recorded documents. Note that because New Mexico is a nondisclosure state, certain types of personal information, including the consideration exchanged in a transfer of property, are withheld from public record. All transfers require a Real Property Transfer Declaration Affidavit, which details the sales information for the transfer. There are certain exceptions, such as an instrument delivered to establish a gift or a distribution, or an instrument pursuant to a court-ordered partition. If the transfer is exempt from the affidavit requirement, detail the reason why on the face of the deed. See NMSA 1978 Section 7-38-12.1(D) for a list of exemptions. File this affidavit with the assessor's office within 30 days of the deed's recordation. This article is provided for informational purposes only and is not a substitute for legal advice. Contact an attorney with any questions related to warranty deeds or transfers of real property in New Mexico.